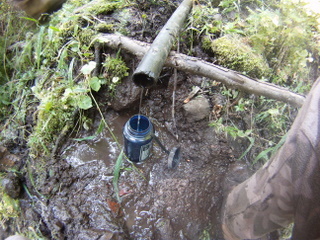 On multi-day, backcountry hunts, having a source of drinking water is an important issue. Water weighs a lot, so it’s not feasible to carry enough to last more than a couple of days. Water in the woods can also be infected with nasty things like giardia, e-coli, and parasites, so drinking that “fresh” mountain spring water could leave you with severe stomach cramps and a trip to the doctor. There are basically two ways to make water safe to drink: filter it, or kill the crud that lives in it. Filters tend to be slow and bulky, but you can start with muddy water and end up with clear water. That’s pretty nice. However, once the filter itself plugs up, you’ll get no water through it at all until you install a new filter cartridge, so it’s best to carry some sort of backup. I got stuck in the backcountry once with a plugged filter and no backup. That really sucked. I don’t like to pack extra gear around, so now I try to find a source of clear, running water and use iodine tablets to kill any creepy crawlies in it. On my recent elk hunting trip, the environment was hot and dry. There was no running water nearby, so we had to improvise. We managed to find a muddy “seep” on a hillside. There was no running water there, so we scratched some grooves into the hillside with a stick to channel the water and then tried various ways to get the water to form a small waterfall to make it easier to pour into our water bottles while avoiding as much solid debris as possible. Luckily, this area had been used as a water source in the past and someone left a short piece of pvc pipe nearby. Having a piece of pipe is a huge help in channeling water (I guess that’s obvious, but when you’re out in the woods and trying to come up with a pipe-less solution, it’s really difficult). The water wasn’t completely free of debris, but it was pretty good. 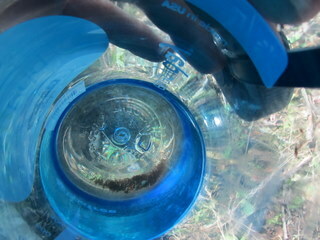 The heavy items settle to the bottom of the water bottle, making them easier to avoid. Before we got the seep pipe setup, we were drinking water that was “lightly brown” in color and gritty. It was safe to drink after iodine treatment, but crunchy water is an acquired taste that I haven’t quite developed yet. Some people really don’t like the taste of iodine, but I’ve gotten used to it. Sometimes I will add some flavored powder, like Propel, to it (sort of tastes like Kool-Aid) to make it more appealing. Water can also be made safe through boiling, but that uses up cooking fuel and also tends to cook the dirt into the cooking pot itself (if you’re using one of those soft metal pots like a Jet Boil). Overall, I think iodine tablets are a really good compromise. Of course, you can always take your chances and drink the water without treatment. I rarely do this, but sometimes I take my chances. 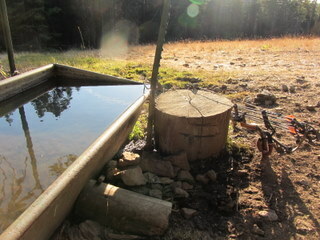 On my recent elk hunt, there was a horse trough where the water flowed right out of the ground through a piece of pipe. 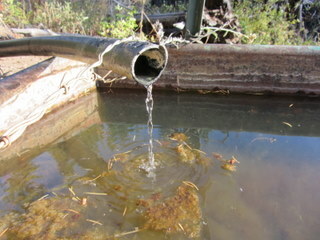 A local outfitter fills up client drinking water there, doesn’t treat it, and has never had any problems. That endorsement was good enough for me and sure enough, I had no ill effects from drinking that water either. This entry was posted in Hiking, Hunting and tagged drinking water, drinking water treatment, hiking, hunting, iodine, potable water, water filter, water purifier. Bookmark the permalink. Newbie interested in what your doing.